Carla Jablonski is the author and editor of dozens of best-selling books for teenage and middle-grade readers. She grew up in New York City, where she attended public schools and the Bronx High School of Science. She has a BA in anthropology from Vassar College and an MA from NYU's Gallatin School, an interdisciplinary program for which she combined playwriting, the history of gender issues in 19th Century Circus, and arts administration. "I wanted to write the play, contextualize the play, and learn how to produce the play for my degree," she explains. "I think I may have been the happiest graduate student at NYU -- I SO loved working toward my thesis." 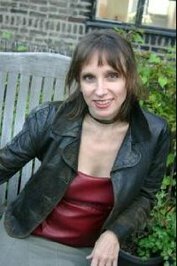 While still in graduate school she supported herself as the editor of The Hardy Boys Mys Carla Jablonski is the author and editor of dozens of best-selling books for teenage and middle-grade readers. She grew up in New York City, where she attended public schools and the Bronx High School of Science. She has a BA in anthropology from Vassar College and an MA from NYU's Gallatin School, an interdisciplinary program for which she combined playwriting, the history of gender issues in 19th Century Circus, and arts administration. "I wanted to write the play, contextualize the play, and learn how to produce the play for my degree," she explains. "I think I may have been the happiest graduate student at NYU -- I SO loved working toward my thesis." While still in graduate school she supported herself as the editor of The Hardy Boys Mysteries. "When I interviewed for the job they asked me if I'd ever read the Hardy Boys as a kid. 'No way,' I scoffed. 'Those are BOY books! It was Nancy Drew for me!' Luckily my future boss had a sense of humor. She hired me after I promised I'd read the books if I got the job." She has participated in the renowned Breadloaf Writers' Conference as well as Zoetrope's All-Story highly competitive writing workshop held at Francis Ford Coppella's resort in Belize. She has taught writing for the children's market, as well as "cold-reading" skills for teachers as part of Project:Read. Several of her books have been selected as part of the Accelerated Reader's program. Which themed book (WWI or WWII) would you like to read for February's group read?